This movie begins at Arctic Minimum on September 10, 2016 and shows daily sea ice concentration until the Arctic maximum on March 7, 2017. 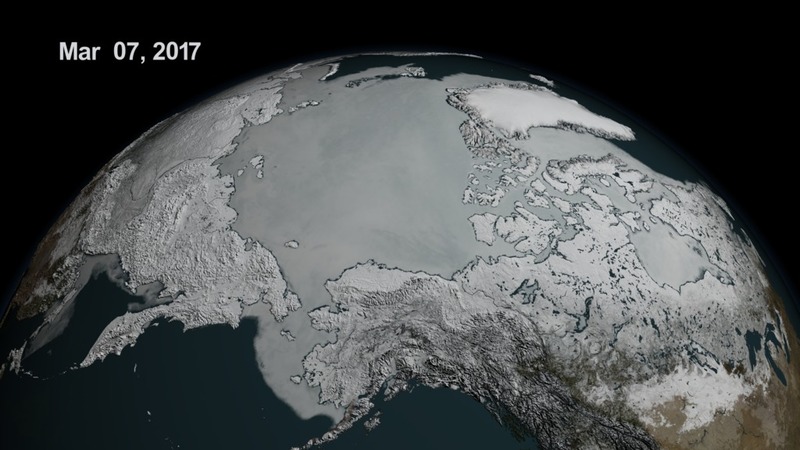 The 2017 Arctic maximum was 14.42 million square kilometers (5.57 million square miles). The average maximum (1981-2010) is 15.64 million square kilometers. 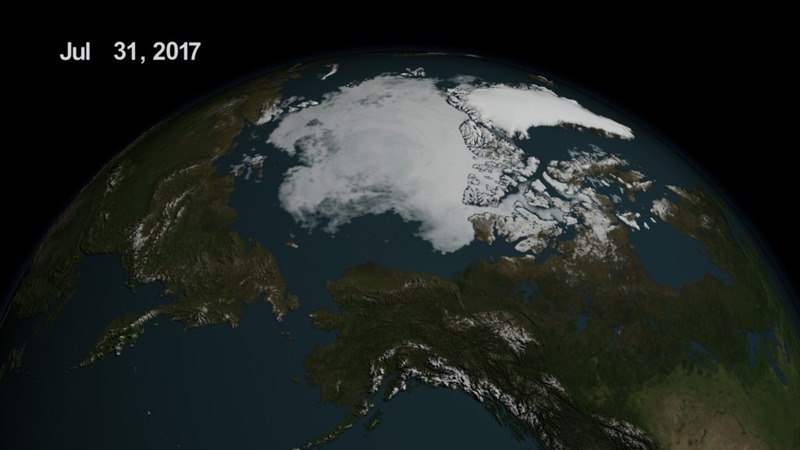 This animation shows the seasonal change in the extent of the Arctic sea ice between the Arctic minimum, September 10, 2016, and Arctic maximum on March 7, 2017. The images shown here portray the sea ice as it was observed by the AMSR2 instrument onboard the Japanese Shizuku satellite. The opacity of the sea ice is derived from the AMSR2 sea ice concentration. The blueish white color of the sea ice is derived from the AMSR2 89 GHz brightness temperature. The annual cycle starts with the minimum extent reached on August 31, 2016 and runs through the daily sea ice concentration until the maximum occurs on March 3, 2017. 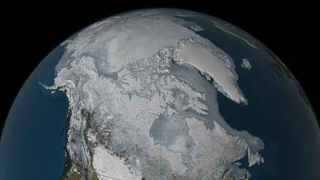 The Arctic’s sea ice maximum extent has dropped by an average of 2.8 percent per decade since 1979, the year satellites started measuring sea ice. The summertime minimum extent losses are nearly five times larger: 13.5 percent per decade. Besides shrinking in extent, the sea ice cap is also thinning and becoming more vulnerable to the action of ocean waters, winds and warmer temperatures. The Arctic sea ice extent minimum on September 10, 2016. 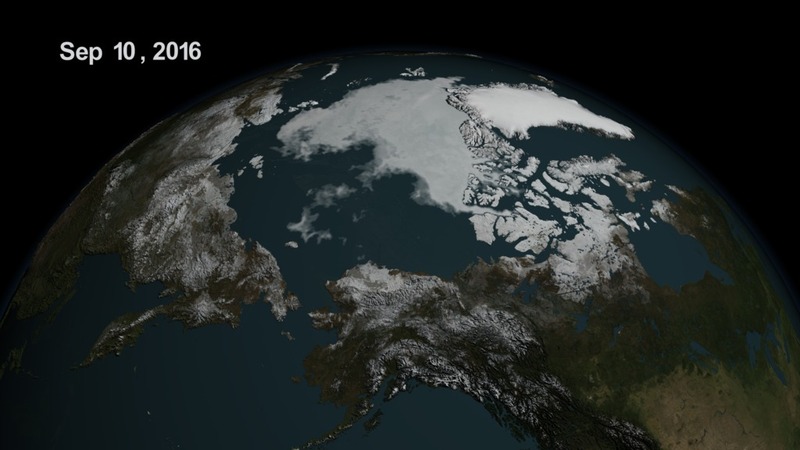 The Arctic sea ice movie extended through July 2017. Data Citation for Greenland DEM: Howat I.M., A. Negrete, T. Scambos, T. Haran, in prep, A high-resolution elevation model for the Greenland Ice Sheet from combined stereoscopic and photoclinometric data.